Before you can paint, you have to prep. Doing prep work the right way, before you repaint a concrete floor can help you avoid a peeling paint job later down the road. 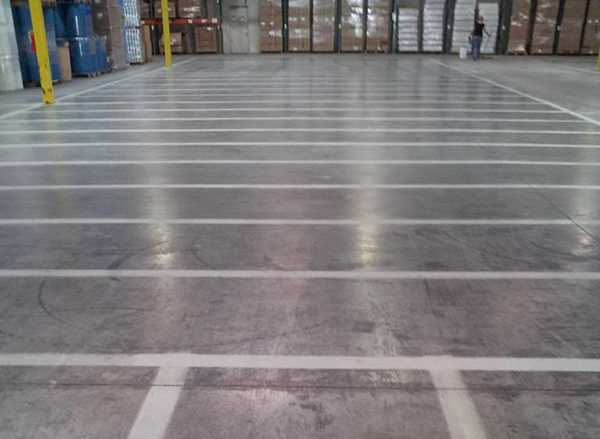 Stripe-A-Lot has the experience and knowledge to make sure your concrete is properly prepped and sanded prior to the installation of new markings. In addition to concrete sanding and prep work, picking the right paint for your concrete striping job is critical for longevity. For example, while latex floor paint is great for interior concrete floors, it is not suitable for high tire-traffic areas. For jobs that will be in high automobile traffic area, we use a durable oil-based product called Set-fast, formulates specifically to withstand the abuse of automobile traffic on exterior concrete patios and side walks.